Haotong Li seemingly took in the shorts on Sunday at the Dubai Desert Classic. 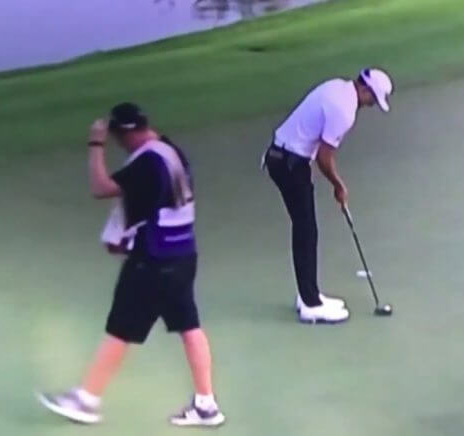 His caddie was standing behind the putting line (a new ruling no-no is caddies lining up the player as he or she is addressing the ball) but did walk away before Li addresses the putt. It was close–probably too close for comfort as you’ll see. I don’t think the looper did anything wrong, but it didn’t so good either. Review for yourself. Li was assessed a two-stroke penalty (and lost $100,000) to fall back from third to 12th place. Cue the chaos. Tour boss Keith Pelley weighed in as the Irish Examiner’s Tony Leen reports. European Tour chief Keith Pelley has admitted that the controversial two-stroke penalty imposed on China’s Haotong Li at the Dubai Desert Classic was “grossly unfair”. However, despite widespread criticism from tour pros on the sanction, Pelley says that under the strict wording of Rule 10.2b (4), the decision made by Tour referees on Sunday was correct. “It is my strong belief, however, that the fact there is no discretion available to our referees when implementing rulings such as this is wrong and should be addressed immediately,” he added. And Pelley admitted Monday: “Everyone I have spoken to about this believes, as I do, that there was no malice or intent from Li Haotong, nor did he gain any advantage from his, or his caddie’s split-second actions. “Therefore the subsequent two-shot penalty, which moved him from T3 in the tournament to T12, was grossly unfair in my opinion. “In an era where we are striving to improve all aspects of golf, we need to be careful and find the proper balance between maintaining the integrity of the game and promoting its global appeal. That’s pretty much spot on. Just like the craziness of not knowing anymore what is deemed a “football catch.” We sports fans tend to know it when we see it. So should those governing the game. The silver lining is Li took the sacrificial punch so his peers could learn. The next offender or their caddie will have no excuse.